What is the 2018 Toyota Sequoia TRD Sport? The 2018 Toyota Sequoia TRD Sport is the newest addition to the Sequoia family. This SUV is built tough and since it’s a sport edition, it can do more than just tow. This model has body-color mirrors and bumper with 20-inch alloy wheels for a dominating appearance. Not only does it look good, it also has the power to go wherever the road takes it. This SUV's engine has 381 horsepower and 401 pound-feet torque that makes this vehicle a real powerhouse. The 2018 Toyota Sequoia TRD Sport can drive over tough terrains and tow big loads. Powered by a 5.7-liter iForce V-8 engine, the 2018 Toyota Sequoia TRD Sport has what you need to get the job done. The 2018 Toyota Sequoia TRD Sport comes in Super White, Magnetic Gray Metallic, and the new Midnight Black Metallic. The 2018 Toyota Sequoia TRD Sport will have 4x4 and 4x2 options. Built with TRD Sport Tuned Bilstein Shocks, this new version of the Sequoia has what you need for comfort, on and off the road. The 2018 Toyota Sequoia TRD Sport is also fitted with TRD front and rear anti-sway bars for improved handling so your passengers and cargo are protected on turns and curves. LED headlights and LED fog lights come standard for inclement weather. This will bring you a sense of ease when driving through less than preferable conditions. The 2018 Toyota Sequoia TRD Sport can seat up to 8 passengers and has a maximum 120.1 cubic feet of room in the back row for any of your cargo needs. It can also haul quite a load with a maximum payload of 7,400 pounds. 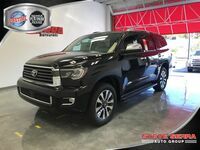 The 2018 Toyota Sequoia TRD Sport also comes with Radar Cruise Control System, Forward-Collision Warning with Pedestrian Detection and Automatic Emergency Braking, Lane-Departure Warning, and Automatic High-Beam Headlights for giving you an extra hand while you drive safe behind the wheel. Want to find out more about this model? Click the RESERVE NOW button that is located above and fill out the available form. After you have completed the form, one of our friendly staff members will contact you with details. If you have questions on the process, or about the model itself, please contact our dealership for more information.